Brenesia 16 (Supl. I): 23. 1979. TYPE: Costa Rica. Puntarenas: primary forest along Río Coto Brus in the vicinity of Alturas, 23 km N of La Union (on Panamanian border), elev. ca. 1,500 m, Croat 26600 (MO-2251852, holotype; CR, F, K, PMA, SEL, US, isotypes; Live at MO). Epiphyte, sometimes secondarily terrestrial; stems 18-30 cm long, 1-1.5 cm diam., branching, creeping, elongate; internodes 0.8-2 cm long; roots numerous, dense, 3-4 mm thick, directed downward; cataphylls thin, 6-11 cm long, gradually long-acuminate at apex (the acumen 2-4 cm long and inrolled) drying tan, persisting, di-lacerating. LEAVES spreading; petioles 5-22 cm long, 4-7.5 mm diam., narrowly, deeply, and acutely sulcate, rounded abaxially; geniculum 1.5-2 cm long; blades lanceolate to oblong-lanceolate, thin to medium thick, gradually long-acuminate at apex (the acumen acute or very minutely inrolled), acute to attenuate at base, 13-30 cm long, 4-7.5 cm wide, broadest slightly below the middle; the upper surface glossy, dulling with age, lower surface glossy or semiglossy; midrib raised, triangular above, diminishing to ward apex, convexly raised below; primary lateral veins 11-16 per side, departing midrib at 55°-65° angle, sunken above, raised below, straight to arcuate-ascending, loop-connecting; collective vein arising from the base or the first or second pair of lateral veins, 3-4 mm from margin, sunken above, raised below. INFLORESCENCE erect-spreading; shorter to longer than leaves; peduncles 20-40 cm long, 1.5-3 mm diam., terete, equalling or longer than petioles; spathe medium green (B & K Yellow-green 5/ 10), linear-lanceolate, 4.5-8.5 cm long, 4-9 mm wide, broadest near the base, long-acuminalc at apex, acute at base inserted at a 50°-70° angle on peduncle; stipe 3 mm long in front, 1 mm long in back, 4-5 mm diam., or spadix sessile; spadix greenish-yellow at base, paler at apex (B & K Yellow-green 8/5 to 6/7.5), 4.5-10 cm long, 3-6 mm diam. at base, 2-4 mm diam. at apex; flowers rhombic, 1.7-2.8 mm wide in both directions, the sides sigmoid; 5-6 flowers visible in the principal spiral, 5-10 flowers visible in the alternate spiral; tepals glossy to matte, papillate, green to greenish-yellow, brown in fruit, the lateral tepals 0.8-1 mm wide, the inner margin thin, turned up against pistil; pistils slightly emergent, green, at first covered by tepals and flat, rapidly emergent into a pointed mound; stigma 0.3-0.5 mm long, ellipsoid, brushlike, white, exserted. small droplet persisting for 1-2 days before stamens emerge, dry and gray when stamens emerge, usually not emerging in the apical half to third of spadix; stamens emerging rapidly from the base in a regular sequence, laterals first followed by alternates, held at the side of pistil, sometimes contiguous; anthers pale yellow, 0.2-0.3 mm long, ca. 0.4 mm wide; thecae ellipsoid, prominently divaricate, opening bowl-shaped; pollen orange-yellow, fading creamy white; strong sweet aroma present when stigma droplets appear and continuing while pollen is fresh. INFRUCTESCENCE spreading-pendent; the spathe green, intact; spadix 5-9 cm long; berries obovoid to depressed-globose, almost flat at apex, pale yellow-green, to 5 mm long; mesocarp watery, clear, sweet; seeds 2, pale green, flattened, to 2.8 mm long and 2.5 mm wide, each enveloped in a clear, gelatinous substance to 4 mm long. Fig. 8. Anthurium angustispadix is known from eastern Costa Rica and western Panama at elevations from 100 to 1,500 m in premontane wet and tropical wet forest life zones. 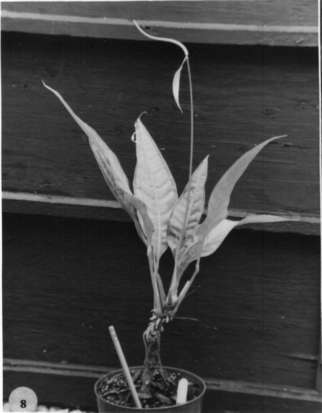 The species is perhaps best placed in section Xialophyllium and is recognized by its slender elongate stems with weathered, tan to pale brown cataphylls; its lanceolate leaves with a narrowly cuneate or attenuate leaf base; and its greenish-yellow, relatively long and slender, tapering spadix with pale yellow-green berries. It is not easily confused with any other species. The species often branches from near the base in pots in the greenhouse. Plants sometimes set seed in the greenhouse without apparent manipulation. Costa Rica Puntarenas: 1150 m, 08.47.30N 82.58.00W, 27 May 1986, Michael H. Grayum, Barry Hammel & Greg de Nevers 7573 (MO).